Wildlife Tour of India & Nepal, a package of 28 nights and 29 days, offers you a chance to explore the wildlife of India and Nepal by paying a visit to their well-known wildlife reserves. During the itinerary, you visit popular wildlife reserves such as Ranthambore, Keoladeo Ghana, Bandhavgarh, Kanha, Kaziranga and Chitwan. The itinerary also includes sightseeing at well-known destinations such as Delhi, Jaipur, Agra, Khajuraho, Varanasi and Kathmandu. Late evening arrival in Delhi. Meet an IHPL representative who helps you with an assisted transfer to your hotel for an overnight stay. After breakfast, on day 2, begin driving to Jaipur. On arrival, explore the magnificent Amber Fort, perched on a hilltop. To go up to its entrance, enjoy an elephant ride. Complete the check-in formalities at your hotel once you reach Jaipur. Later, proceed for sightseeing covering The City Palace, Hawa Mahal and Jantar Mantar Observatory. Stay overnight. 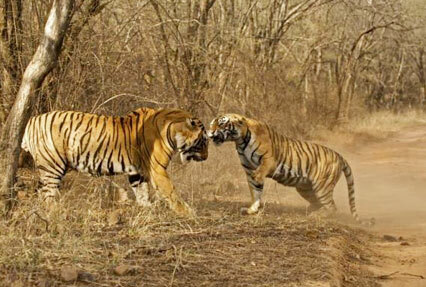 Post breakfast, hit the road to Sawai Madhopur for Ranthambore National Park. On arrival, check-in at your jungle resort. Popular as one of the largest national parks of the northern region of the country, Ranthambore is home to a good population of the big cats. Take a jungle safari in the afternoon. Stay overnight. Days 4 and 5 of the tour are booked for all-day long jungle safaris into the park with lunch breaks in the afternoon. This former hunting ground of the Maharaja of Jaipur, it has a variety of flora and fauna. During the safari, spot numerous animal species includingChinkara, Common Kraits, Common Palm Civet,Toddy cat, Coomon Yellow Bats, Desert Cats,Common Frog,Fivestriped Palm Squirels, Indian False Vampires, Kraits, Cobras along with around272 bird species. Enjoy an early morning jungle drive in the park. Have breakfast at the jungle resort and later, begin driving to Bharatpur to visit the Keoladeo Ghana National Park. It was formerly known as Bharatpur Bird Sanctuary. On arrival, complete the check-in formalities at your jungle lodge. The evening is scheduled for a short walk inside the park. Admire the flora of Keoladeo. Stay overnight. On the 7th day of the tour, indulge in bird watching during a boat ride, spottingas many as 370 species of birds. The list of avifauna species of the park includes Painted Stork,Common Parakeet, Great Egret, endangered Siberian Crane,Comb Duck, Gadwall, Shoveler, Common Teal, Cotton Teal, Tufted Duck etc. Common Indian gray mongoose, spotteddeer, fishing cat, Jackals, Hyenas are some of the animal species that are found in the park. Overnightstay. Today, after breakfast, begin driving to Agra. 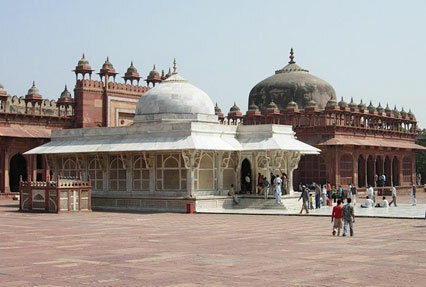 On the way, halt at the old deserted Mughal capital of Fatehpur Sikri where you explore its various structures inside including Jodha Bai Palace, Buland Darwaza, Panch Mahal, Diwan-i-Aam etc. Proceed to Agra. On arrival, check-in at your hotel. Later, leave for sightseeing of the Taj Mahal – one of the Seven Wonders of the World. It is a white-marble mausoleum, constructed by Mughal Emperor Shah Jahan in the memory of his beloved wife Mumtaz Mahal. The other visit is to the Agra Fort, also known as Red Fort. Stay overnight. On the 9th day of the tour, post breakfast, get transferred to the railway station to board a train to Jhansi. On arrival, hit the road to Khajuraho. Relax for some time. Later, leave for sightseeing of the UNESCO World Heritage Site of Khajuraho temples. These temples, erected during the reign of Chandela rulers, glorify erotica. Stay overnight. The morning of day 10 is booked for another visit to the world-renowned Khajuraho temples. Later, get on-time transfer to the airport to board a flight to Varanasi. On reaching, complete the check-in formalities at your pre-booked hotel. Afterwards, proceed for sightseeing where you may visit the popular temples and the local bazaars. Overnight stay in Varanasi. Enjoy an early morning boat ride (during sunrise) in the holy waters of river Ganga. Observe the culture of this sacred ancient city. Later, enjoy a walk around the Ghats. Back to the hotel for breakfast. Later, get transferred to the airport, to board a flight for Khajuraho. On arriving in Khajuraho, leave for Bandhavgarh National Park, by road. Late evening arrival in Bandhavgarh. The park has a vast variety of flora and fauna as well as is famous as breeding grounds for a number deer species. Complete the check-in formalities at your jungle lodge. Days 12 and 13 of the tour are booked for morning and evening jungle safaris in the national park. A wildlife safari into the former hunting grounds of the Royalty of Mewar is an exciting activity. There is a high probability that you may spot the big cats here as thepark hasa high density of tiger population. The primewildlife attraction during the safari includes Panther, Spotted Deer, Sambhar deer, Nilgai (Blue bull), Gaur, Wild Boar and as many as280avifaunaspecies. Participate in tiger tracking in the park today. Post breakfast, hit the road to Kanha National Park, popular as the inspiration behind Rudyard Kipling’s famous novel “the Jungle Book’. On arrival, check-in at your jungle lodge. In the evening, watch a film on wildlife and meet the in-house game expert. Stay overnight in Kanha. 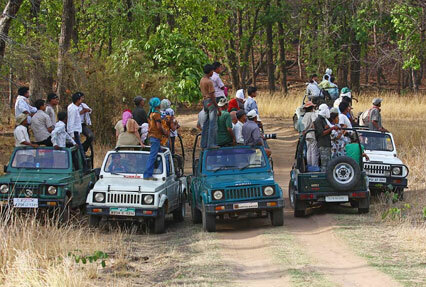 Embark on morning and evening safaris into Kanha, one of the most well-maintained national parks in the country. During thesafari, spot a large variety of flora, along with animal species such as Royal Bengal Tiger, leopards, sloth bear, Indian wild dog and Barasingha, popularas the Pride of Kanha. Do not miss watching sunset at the Bamni Dadar point, which is also known as the Sunset Point. Overnight Stay. The morning of day 16 is for a wildlife safari into the park. Back to the resort for breakfast. Take some rest. In the evening, begin driving towards Nagpur. On arriving in Nagpur, complete the check-in formalities at your pre-booked hotel for an overnight stay. Have breakfast at the hotel. Get on-time transfer to the airport to board a flight to Kolkata. On reaching, check-in at your pre-booked hotel. The rest of the day is free – interact with the locals, relish local delicacies, visit city’s popular attractions such as Howrah Bridge, Birla Planetarium etc. Overnight in Kolkata. In the morning, get transferred to the airport to board a flight to Guwahati. On arrival, hit the road to Kaziranga National Park, a UNESCO World Heritage Site. Home to 2-3rd of the world’s population of One- horned Rhino, this national park is one of the most popular ones also. The rest of the day is free for individual activities. You can take a nature walk or can simply admire the surrounding lush greenery. Stay overnight. Days 19 and 20 of the tour are booked for morning and evening jungle rides in the park. Along with one-horned rhinos, the major wildlife attractions at the park include wild boar, Barasingha deer, Hog deer, Asian elephants, Rose-ringed parakeets, Jungle fowls, Pallas’s fish eagle, Great Indian Hornbill, Wreathed Hornbill, Old World babblers etc. At night, enjoy dinner around bonfire. Post breakfast, get transferred to the Guwahati airport. Board a flight to Delhi. Once you reach the capital city of India, complete the check- in formalities at your hotel. The evening is scheduled for some rest and dinner. Overnight stay. On day 22, get on-time transfer to the airport to board a flight to Katmandu. Upon reaching Katmandu, check-in at your hotel. Relax for the rest of the day or indulge in leisure activities such as interacting with the locals, exploring the surroundings on foot, tasting the local renditions etc. Stay overnight. Have breakfast at the hotel. Visit the Pashupatinath temple for Darshan. Proceed to Chitwan National Park (by flight). 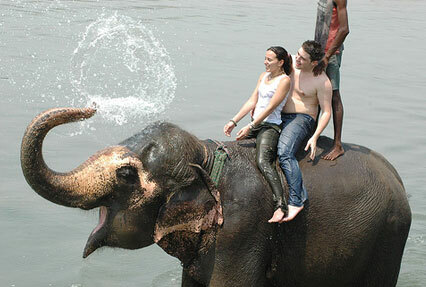 Formerly known as Royal Chitwan National Park, this national park is a UNESCO World Heritage Park. This park is home to a good population of single-horned Asiatic rhinoceros, Gharial Crocodile and the Bengal tiger. On reaching, check-in at the lodge. The evening is at leisure. Stay Overnight. Days 24 and 25 are booked for elephant rides and bird watching at the park. During the safari, you spot animal species that include Leopards, Golden jackals, rare marbled cat, Spotted linsangs, Four-horned antelopes, palm civets, hanuman langurs, Indian pangolins, endangered hispid hare etc. The park is also home to as many as 534 bird species including Gould’s Sunbird, slender-billed babblers, Slaty-breasted rail, Bengal Pittas, Pallas’s Fish-eagle. Today, after breakfast, get transferred to the airport to board a domestic flight to Kathmandu. On reaching, complete the check-in formalities at your hotel. 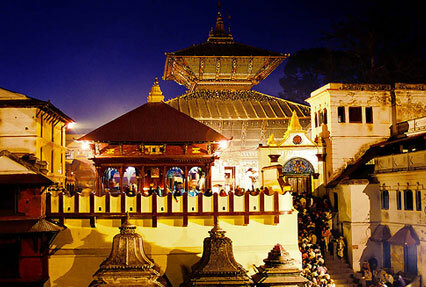 Leave for sightseeing of Kathmandu or Basantpur Durbar Square, a UNESCO World Heritage Site. Now known as Hanuman Dhoka, it is the social and religious center of the city. Stay overnight in Kathmandu. Post breakfast on day 27, leave for sightseeing of Patan and Bhaktapur Durbar Squares – UNESCO World Heritage Sites. The list of attractions may include the Patan Museum, Golden Window, Krishna temple, Mini Pashupati Nath, 55 Window Palace etc. In the evening, you can either relax or take a leisure walk in the Thamel area – an important tourist attraction, housing numerous shops, restaurants and hotels. Stay overnight. After breakfast, begin your day with sightseeing of the other World Heritage Sites - Swayambhunath and Pashupatinath. Swayambhunath, also known as the Monkey Temple, it is an ancient religious complex, situated on a hill top. Pashupatinath temple, dedicated to Lord Shiva, it is one of the world’s most popular temples. Later, get on-time transfer to the airport to board a flight to Delhi. On arrival, check-in at your hotel for an overnight stay. Once you have breakfast, leave for a city tour of Old and New Delhi including Red Fort, the complex of Qutab Minar, Jantar Mantar and so on. Later, indulge in last minute shopping at the popular markets. Get transferred to the airport to board a flight for your onward journey.